Ted Cruz likes to copy Donald Trump. He’s changed his immigration plan and now says he wants a border wall. But less than two years ago he was handing out gift baskets and soccer balls to illegals at the border. 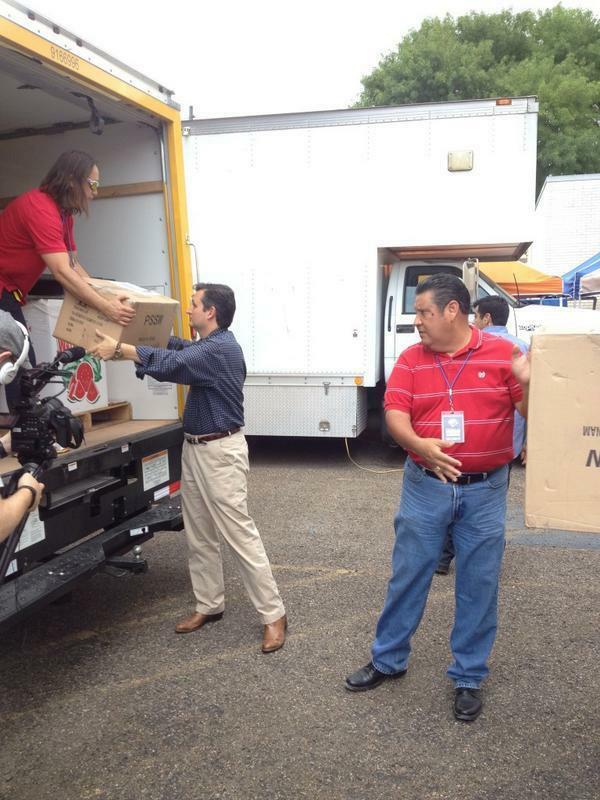 Ted Cruz hands out gift baskets to illegal aliens at the Texas border in 2014. Friday in Milwaukee former Governor Sarah Palin reminded the Republican audience of Senator Ted Cruz’s weak and opportunistic immigration position. Palin also told them about how Cruz seduces immigrants into America with gift baskets and soccer balls. …Whenever anyone dares to tell the collective: ‘the emperor stands naked’; there’s a particular kind of autonomic group nervousness immediately evident. A group discomfort.